MillerCoors today announced it is going to launch a craft and import beer business that will remain independent of the main MillerCoors company (see The Business Journal of Milwaukee story). The new craft/import company will be called Tenth and Blake Beer Company. The name comes from the two successful craft breweries where Leinenkugel‘s and Blue Moon are brewed. Both breweries are now owned by MillerCoors. Leinenkugel’s is brewed at Miller’s Milwaukee, Wis. brewery located at 1515 N. 10th St., while Blue Moon is brewed at a brewery (the Sandlot) on Blake St. in Denver, Colo. The crafts and imports business have been performing well for MillerCoors of late. In the second quarter, the business was led by a strong performance of Blue Moon and Leinenkugel’s, and the segment delivered double-digit growth. Crafts and imports are outperforming MillerCoors premium flagship brands like Miller Lite and Coors Light, which are posting flat or declining sales. So now that Blue Moon and Leinenkugel’s are outselling Miller Lite and Coors Light, MillerCoors is following the money and seeing where it will lead. In addition to being a standalone company, Tenth and Blake will also have its own marketing budget and sales organization. It will be interesting to see how this affects existing craft breweries. The distribution might of MillerCoors means whatever beers are created and branded by Tenth and Blake will be spread widely through supermarkets and convenience stores. It also means that unlike Budweiser – which has released craft-style beers such as its American Ale and Bud Light Golden Wheat brands – MillerCoors intends to put all of its craft-style beers inside of a different bucket than the main MillerCoors bucket. You’re not going to see a Coors Light Amber Bock or an MGD Farmhouse Ale, basically. Instead, it will be Olde Timey Eccentric Craft Beer Name’s Lager. Long and short of it, Tenth and Blake could shove existing craft beers off the shelves. The one positive is that, as the Biz Journal article states, MillerCoors is having much more success selling hefeweizens, ales, and bocks over light beers in gimmicky bottles and cans – when the mountains turn blue this beer vortex manipulator is gonna get you drunk faster. Hence, the average American beer drinker is seeking more flavorful and interesting beers than the old standards, while the big, industrial, mass-market beer-makers of yore are looking to take advantage of that. Can craft beer win out with its historically smaller market share or will it be shoved into becoming a niche market for beer snobs alone? This is the part of the story where we wander our way into the very tip of the inverted triangle. Ahem. Some assistance could arrive in the craft brewing bill S. 3330. The bill, which was introduced by Sen. John Kerry (D-Mass.) and Sen. Mike Crapo (R-Idaho), would enact a reduced, graduated tax rate for small, American brewers (see Brewers Association for more info). The bill would free up money for craft brewers by cutting the Federal excise tax from $7 a barrel to $3.50 a barrel for the first 60,000 barrels a brewer produces. More cuts would be enacted as more barrels are produced. In other news, earlier this week Vermont’s Magic Hat craft brewery was purchased by Genesee Brewing Company and Dundee Ales & Lagers, which distributes Labatt beers and Seagram coolers (see AP story). 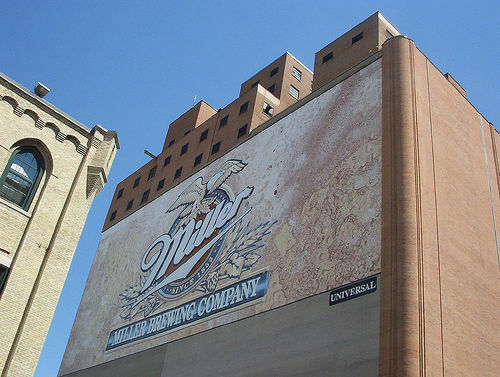 Photo of the Miller Brewing Co. in Milwaukee, Wis. via Conspirator/Flickr/Creative Commons.